The new planet was discovered by Nasa’s Kepler space telescope two years ago but new research has identified it as the most similar to our own yet discovered. Kepler 22b is about twice the size of Earth and has temperatures which average around 72 degrees (22 Celsius). It also contains the right atmosphere to potentially support life. However, there is a downside: it is 600 light years from Earth. 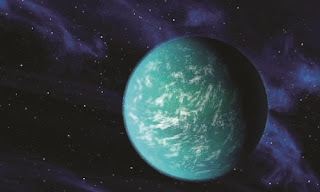 Kepler 22b is the first so-called "super-Earth" known to lie within the "habitable" zone of a star similar to our Sun. Dubbed the "Goldilocks Zone", this is the band where temperatures are just right to allow the existence of surface liquid water throughout its orbit. This means the planet could have continents and oceans just like the Earth, and where there is liquid water, there could also be life, they say. Scientists believe Kepler 22b may not only be habitable, but possibly already even inhabited. "This discovery supports the growing belief that we live in a universe crowded with life," said Dr Alan Boss, from the Carnegie Institution for Science in Washington DC, who helped identify the planet from data obtained by the Kepler space telescope. The telescope, launched by the American space agency Nasa, is watching 155,000 stars looking for tiny drops in brightness that betray the presence of planets. The star around which Kepler 22b orbits, in the region of the constellations of Lyra and Cygnus, should you know them, is slightly smaller than the Sun and about 25% less bright. The planet orbits the star in 290 days, at a distance 15% closer than the Earth is from the Sun. It lies right in the centre of the star's habitable zone, where potentially perfect conditions exist for life. Two other small planets orbiting stars smaller and cooler than the Sun have recently been found at the very edges of their habitable zones. Their orbits more closely resemble those of Mars and Venus. A report on the discovery will be published by the Astrophysical Journal. Dr Douglas Hudgins, Kepler programme scientist at Nasa headquarters in Washington, said: "This is a major milestone on the road to finding Earth's twin." The planet was spotted after making a "transit" across the front of its parent star, causing the star's brightness to dip.